The iconic Fountains of Bellagio perform daily to music and crowds that gather along the shores of this picturesque man made lake on the center of the Las Vegas strip. I might be a bit of a romantic but watching the Fountains at Bellagio Las Vegas dance and captivate the audience does something to me. I forget about the bells and whistles of the casino floor and I feel removed from the tourists walking the strip with giant plastic cups holding 32 ounces of slushy alcoholic drinks. The Fountains at Bellagio Las Vegas feel elegant and classy. They make me feel like I am the only person watching on the shore of the lake. They make me want to stand around and have a glass of Prosecco as I hug someone who makes me warm, comfortable and nervous inside. Right on the Las Vegas strip every 30 minutes the Bellagio fountains give up a Las Vegas experience for free. Go ahead, just watch and enjoy and you might feel the magic as well. Stand out front of Bellagio Las Vegas and watch as the music and the water are perfectly choreographed for your pleasure. This might be the best free show in Las Vegas. The Fountains at Bellagio can be very romantic. If you really want the full effect, go in to the Bellagio Hotel and get a seat at Olives. Enjoy some fine food and the show while indulging! If you are into nightlife go into HYDE Bellagio and catch the fountains from their Balcony while sipping on a cocktail. Another great vantage point is the dining room at LAGO where the fountains dazzle duirng lunch and dinner service. 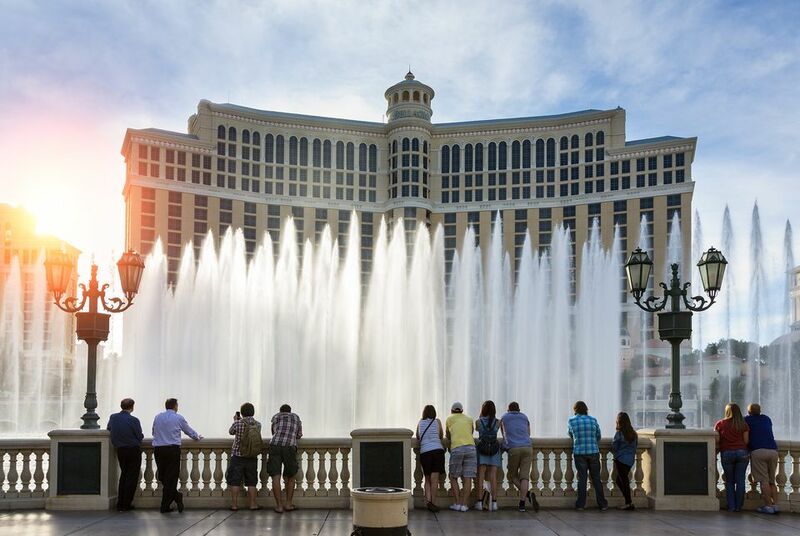 Bellagio Fountains are among the best of the free shows in Las Vegas and this area of the Las Vegas strip has plenty to offer the budget traveler. Walk into Bellagio Las Vegas and you'll be treated to seasonal displays at Bellagio Conservatory and Gardens. This free attraction boats a large atrium with fresh plants and flowers decorate to celebrate the season. Nearby, in front of the hotel check-in desk you'll see the Dale Chihuly glass sculpture that hovers overhead. Take a look at the detail in each of the hand crafted glass petals in the sculpture. Also, nearby is the World's Largest Chocolate Fountain and if you take the tram to Aria Las Vegas where you can tour the City Center Art Collection. There are plenty of free activities in Las Vegas, you just need to seek them out. Here is a list of even more cheap and free things to do in Las Vegas.